Now for my favorite part of any good cake – FROSTING! I do admit to being a cake snob. I detest most grocery store cakes. The cake is mediocre at best, and the frosting is extra sweet and greasy. Together it is disgusting. I only eat them out of politeness. I have NEVER bought one myself – I always make mine. While in the beginning they may not have looked as pretty, but they always tasted better (well, except for one but I really don’t want to talk about that). In order to have a great cake, you must have a frosting that crusts. If it does not crust, it will not be extra smooth. 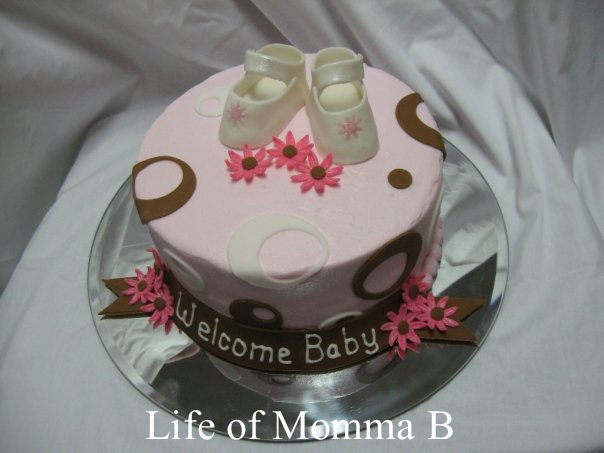 Baby shower cake made previously. Here is a cake I made previously. I frosted the entire cake using the frosting recipe below. Then I added fondant accents. I picked up my frosting recipe many years ago and tweaked it to make it my own. There are two secrets to this recipe – cake flour and Lorann’s Princess Cake and Cookie Emulsion. The cake flour helps to stabilize the frosting which is critical if you live in a humid location. Princess flavoring is a citrus – almond blend that is absolutely out of this world. Sift cake flour before measuring. Using an electric stand mixer, combine shortening and cake flour until smooth. Add water, salt and flavoring. Then add sugar slowly on medium-low speed. TIPS: The flavoring options are endless try Lorann’s Princess Cake and Cookie Emulsion, clear vanilla, or for a more traditional buttercream taste use butter flavoring. The amount of water needed will vary by the consistency desired. The amount listed above will create a medium consistency frosting that can be used to ice the cake and for most piping work. Do not over beat the frosting, it will create air bubbles in your work that are a pain to get rid off. When I taught the Cake Decorating badge, I had the girls mix a batch and we used it to complete requirement #6. NOTE: Please be sure to read the AHG Girl Handbook to make sure you fully understand the requirements. This entry was posted in American Heritage Girls, Cake Decorating, Recipes and tagged AHG, baby, cake, Cake Decorating, Family Living Frontier, frosting, merit badge, printable. Bookmark the permalink.